Spring is here and it’s time to blossom into the person you’ve dreamed of becoming all year. Stress free! As you journey into unleashing your inner boss there are only two things standing in the way. Fear and stress. Well, fear causes stress. In order to overcome stress we must realize that we were never in control. Where is the anxiety in knowing that the universe guides us? Luckily as human beings we have the ability to overcome it. Never allow stress to consume and deter you from becoming the person you’re supposed to become. Meditation allows you to become more self-aware and cognizant of your surroundings. You will feel more at ease and less vulnerable. It improves circulation to your brain enabling you to have better concentration and improve your memory. It also improves your mood and makes you feel less agitated. Meditation is a great way to let go of everything and align yourself with the universe. It will make you feel more positive and ready to conquer your week. I have a personal love for green tea. Nothing makes my life more livable than relaxing with a hot cup of tea. The aroma in tea is said to calm the heart rate down and improve your cardiovascular system. Inhaling the aroma while it is brewing will calm your nerves down and make you feel so relaxed after a long day. Chamomile and Lavender tea are both caffeine free and most recommended. According to many health care publications massaging your feet before bed reduces anxiety, depression, and stress. It also reduces headaches and improves circulation. There are many charts that show that our feet connect to many of our organs. It is important to care for our feet on a regular basis in order to improve our overall health. According to the Huffington Post retail therapy eases anxiety. “Psychologists have found that people tend to shop the most leading up to big life transitions.” Big transitions lead to stress which can be healed by shopping. This doesn’t mean to blow a paycheck on a new bag. You must be mindful of your budget and shop responsibly. Shopping is very therapeutic even if you don’t make the purchase. Trying on clothes makes people feel more beautiful and confident. Music is said to have been used for hundreds of years to treat illnesses and restore harmony between mind and body. In today’s time listening to music has made people feel relaxed, at ease, and free. It is great for meditation to put on a song that inspires you and to just let everything go. Listening to the words of a song that inspires you can be both motivating and encouraging. Laughter has been said to improve your mood, immune system, relieve pain, and soothe tension. Laugh more and you will notice that your stress and anxiety levels will decrease. A laugh a day keeps the doctor away. Writing down your thoughts is probably one the most stress relieving things a person can do. Writing is a form of expression that enables you to put everything on paper and let it go. If there is something that is weighing heavy on your heart write it down and I promise it will make your stress levels go down. Dancing has proven to be a great way to relieve stress. Whether you are the best dancer or not, getting up and getting active can take your mind off of everything. Expressing your emotions in lyrical dance, or even hip-hop is a great way to lower stress levels and just be you. 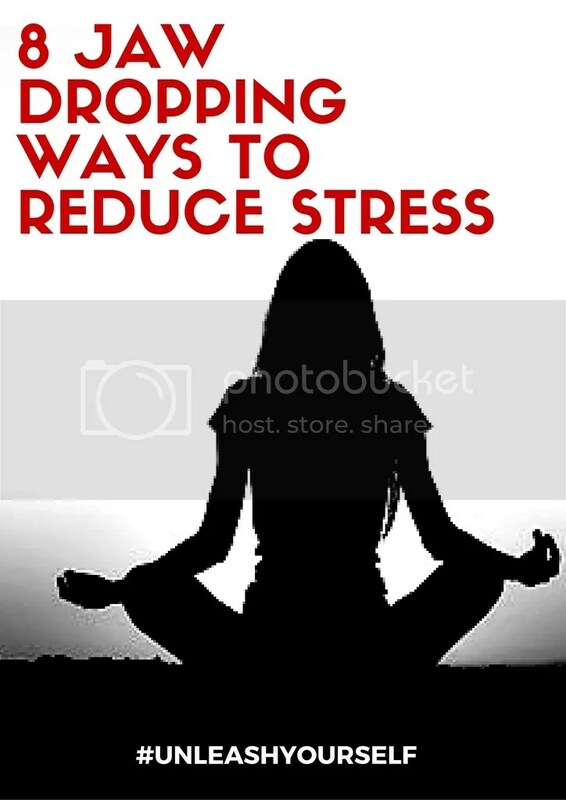 Applying these tips towards reducing your stress levels can and will make you a better and happier person. Amira Onibudo is the founder of Unleash Yourself, an inspirational blog that focuses on the importance of conquering fear and unleashing your inner boss. Millennials are faced with boundaries and limitations only when they “think” they are. Amira’s goal is to inspire and motivate young professionals to unleash their talents and never be afraid to unleash the boss living inside of them. You can follow her around the web on Instagram and Facebook.